The Seventeenth Judicial District Commission on Judicial Performance unanimously recommends that Judge Mark Douglas Warner BE RETAINED. Judge Warner graduated in 1981 from Iowa State University with a Bachelor of Arts in Political Science, and obtained his Juris Doctor in 1990 from the University Of Denver College Of Law, where he graduated with honors. 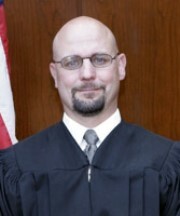 Before his appointment, November 10, 2005, to the District Court in the 17th Judicial District, Judge Warner served as the Chief Trial Deputy in the District Attorney’s Office for the 17th Judicial District, where he supervising felony prosecutions and the Complex Crimes Prosecution Unit. He also served as the Legal Advisor to the VALE Board and Legal Advisor to Victim Compensation Board. From 1991 to 1992, Judge Warner worked as a defense attorney for the firm of Lozow, Lozow & Elliott, in a general law practice with an emphasis on criminal defense litigation. Prior to becoming an attorney, Judge Warner was a police detective for the City of Thornton, assigned to the Special Investigations Unit handling complex investigations, drug investigations, crimes against persons, and crimes against property. During this review period, Judge Warner presided over cases in two divisions with a caseload made up of 35% Juvenile and 65% Criminal matters. The Commission’s evaluation is based on extensive research including review of professionally conducted survey findings for both attorneys and non-attorneys who have appeared in his courtroom, a personal interview with the judge, Judge Warner’s own self-evaluation, review of legal opinions rendered by the judge, case-processing statistics, and personal observations of the judge in his courtroom. He received average ratings from attorneys and above average ratings for non-attorneys. Of attorneys responding to the survey 87% recommended to retain, 0% not retain, and 14% made no recommendation regarding retention. Of non-attorneys responding to the survey 92% recommended to retain, 2% not retain, and 6% made no recommendation regarding retention. (These percentages may not total 100% due to rounding). The Commission, during its’ interview with Judge Warner, was impressed with his commitment to learn from the survey results and to maintain his high judicial standards. He holds respect and integrity as high priorities and takes steps daily to demonstrate an appropriate judicial demeanor. Judge Warner feels earnestly about the importance of community service. Prior to and since being appointed, he has been involved with the Adams County Access to Justice Committee, the Sean May Run, and currently serves as a member of the Colorado Supreme Court Criminal Jury Instructions Committee. The Commission unanimously recommends that Judge Mark Douglas Warner BE RETAINED.